The Chris Wallace interview with Congressman Jim Jordan (R-OH) starts at the 12:26 mark in the video, with the discussion first addressing the enormous spending bill that was just passed through Congress and the failure of Republicans to support and force fiscal responsibility upon the federal government. He agrees that Republicans don’t have the sixty votes needed for impunity of action in the Senate but neither do the Democrats and is in favor of changing the Senate rules to allow for things to get done legislatively. Wallace asks if, given those realities, if he’s saying the minority Democrats won and Republicans caved. Jordan corrects that mischaracterization, informing Wallace that it is the package that is consistent with what the voters told Congress in the 2016 election.” It’s hard-line to open borders, establishment types like Wallace, in that it demands real security before giving away the store in the form of citizenship for illegal squatters. After noting that there are serious problems with Paul Ryan’s leadership, as evidenced by the huge spending increase, Jordan doesn’t call for his resignation, leaving that issue to after the immigration debate. Clearly Ryan’s performance on that issue will play a major role in whether or not he remains Speaker and the level of opposition he faces. 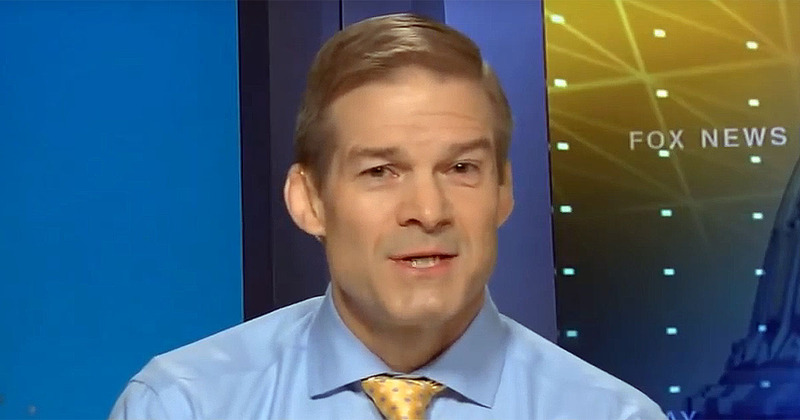 Jordan then goes on to promote the Goodlatte bill on immigration over the nonsense coming out of the Senate and points to the overlooked by many, including Wallace, big news that came out this week that the DOJ was updating Obama on the progress of their attacks against Trump and their cover up of Clinton. That should be the lead item of discussion in the media but for some “strange” reason nobody seems interested. I’m not sure anything is going to change. The majority of voters are simply saying “at least Clinton is not President”. I certainly agree with that but using that to give a pass to the current state of affairs is no better than the sycophants who hailed the big0. the UNIPARTY SWAMP CREATURES WON AGAIN, and WE THE PEOPLE LOST. but I AM DAMN TIRED OF LOSING. DIRECT ACTION NEEDS TAKEN AGAINST ALL THOSE SWAMP DWELLERS, THEY ARE A DIRECT THREAT AGAINST WE THE PEOPLE, AND OUR NATION AND THEY PROVE IT EVERY DAMN DAY. I heard on the CBS morning news today that they were going to take money away from Medicare. So we are paying into it so they can skim off of it to support all of the free loaders that are here in our country illegally. Ryan was the jerk who thought that one up, and the President said he wasn’t going to touch Social Security or Medicare. What the hell are we suppose to do if that happens. I’m paying over $300 a month for medical insurance and I’m on Social Security. The illegal free loaders, and refugees get Welfare, food stamps and Medicaid. Now they want to keep DACA and dreamers, so we can keep on supporting them. We need a revolution.